Brown and grizzly bears are classified as the same species, Ursus arctos. Brown bears on Kodiak Island are classified as a distinct subspecies from those on the mainland because they are genetically and physically isolated. The term “brown bear” commonly refers to animals found in coastal areas, and brown bears found inland and in northern habitats are often called “grizzlies. Like black bears, brown bears vary widely in color. Brown bears can range from dark brown through light blond. 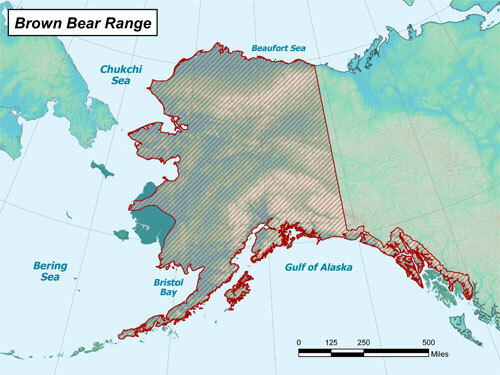 Brown bears are found throughout Alaska except on the islands south of Frederick Sound in southeastern Alaska, the islands west of Unimak in the Aleutian Chain, and the islands of the Bering Sea. Except for breeding pairs and females with offspring, bears are typically solitary creatures and avoid the company of other bears. Exceptions occur where food sources are concentrated such as at streams where bears can catch salmon swimming upstream to spawn.